In spite of their advancing age, the Boomers are up for a challenge. Over my adult life millions of middle aged Canadians have run a marathon, competed in a triathlon, joined a local boot camp, climbed a mountain or in the more recent years, signed up for an endurance race. Last year at Whistler, my 50 yr. old sister in law, a corporate executive not known to get too dirty in a day, dragged her gel nails through mud, rain and freezing pools of water to complete in the Tough Mudder. Today, these events are not the exclusive domain of the gloriously athletic, but instead are populated by ordinary citizens out for a challenge. Personally I prefer the challenges found in the mountains. If they are covered in rock, snow, ice, glaciers or just high, count me in. For a long time getting into the mountains was challenge enough and then in my fifties with no kids at home the new challenge became;” How high can I climb”? My kids vetoed Everest so, as a consolation trip I climbed Mt Rainier. I tried to cajole a solo trip to Denali out of the family but that was another ”NO” from the smarter ones. (Everyone excluding me). I then started a campaign for Aconcagua in Argentina. This is a smaller hill at 22,837 ft. (6,962m) and does not involve technical skills. My husband, Bill the Wise, suggested Kilimanjaro instead. After all, it is lower at 19,341 ft. (5,895m) and he would consent to come as well. Kilimanjaro is the highest peak on the continent of Africa. Thousands of Mzungu kichaa (crazy white people) climb it every year. You need to be in good physical shape, have good rain and cold gear and 5 to 7 days to reach the top. Succeeding is based on the interplay of three components- physical fitness, mental toughness and how your body responds to altitude. The first 2 are up to you. The third is the unknown variable. Adjusting to altitude is partially genetic. Being very fit and stubborn does not guarantee that” thin air “(very low oxygen) at high altitude will agree with you. For example, several years ago, the world-class tennis player, Martina Navratilova, succumbed to life threatening acute mountain sickness (AMS) and required evacuation from Kilimanjaro. The real cure for AMS is, of course, not to get it. It is avoided by not climbing too high or too fast. Proper hydration and caloric intake are essential as is descent to lower altitude at its first signs. The deadly effects of altitude are real and every year several people die on Kilimanjaro because they did not descend in time. It is wise to purchase medical evacuation insurance if you plan to go to altitude. Mild AMS can occur above 8,000 ft. (2,400m) and manifests as a sledgehammer headache that does not respond to analgesics. No one will die from AMS, but they can if it advances. Two medical conditions that can result from AMS and that can kill climbers are HACE (high altitude cerebral edema or brain swelling.) and HAPE (high altitude pulmonary edema or fluid on the lungs). HAPE is the condition most commonly associated with death at altitude. Early HAPE manifests as a persistent cough, shortness of breath even at rest, fever and/or bronchitis while early HACE can be diagnosed by loss of balance, headache, nausea, vomiting or reduced mental acuity. In advanced HAPE persistent cough produces pink sputum as a bloody fluid collects in the lungs while in advanced HACE brain swelling can lead to paralysis, coma and death. 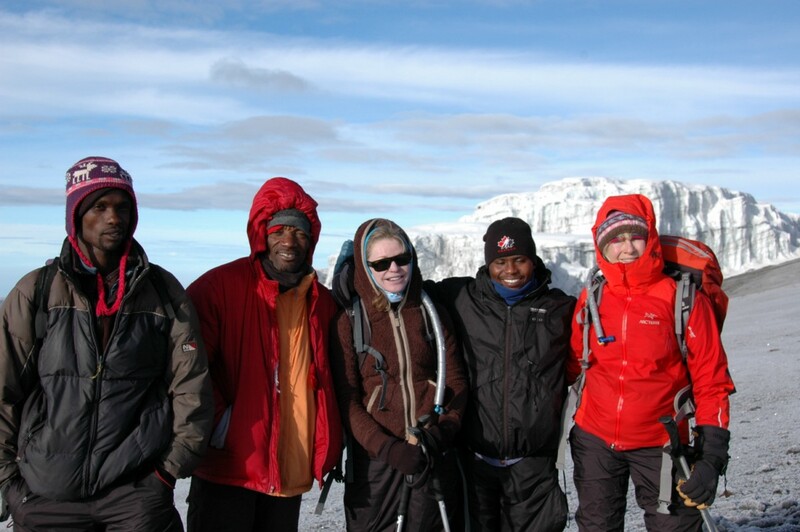 So did we make it to the top of Kilimanjaro? Yes. Did I like very high altitude? Not so much. Would I do it again? The answer is definitely maybe. Perhaps I would try Aconcagua, on a few more medications. Firstly, I suspect, this will require intense negotiation at home. 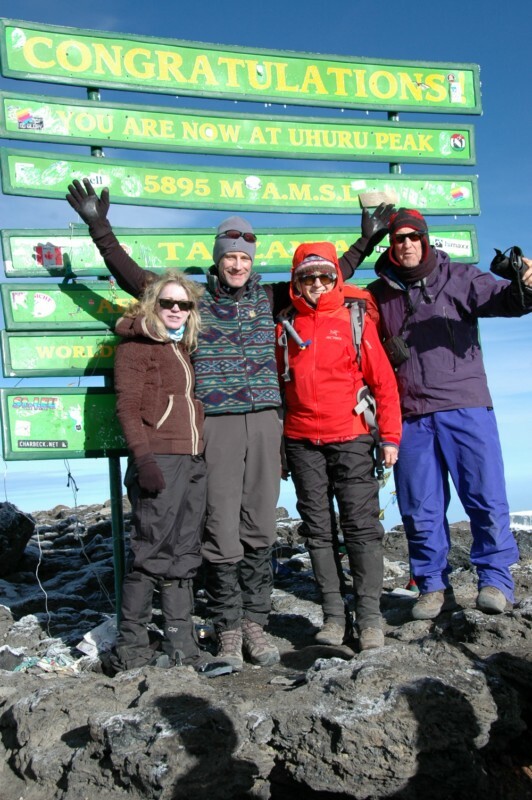 This entry was posted in Uncategorized and tagged Boomers, high altitude medicine, Kilimanjaro by April Sanders. Bookmark the permalink. Can I interest you in a nice, not-so-high altitude hike? ?